Transition is free but pre-event registration online is essential. 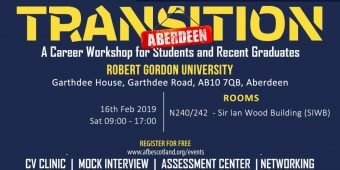 The event is open to students and recent graduates of the University of Aberdeen and Robert Gordon University. In addition, identification, such as passport or driver’s licence, may be required for security reasons. AFBE-UK Scotland was established in Aberdeen in November in 2011 and is the Scottish chapter of AFBE-UK. The Transition event will be held in rooms N240/242 at the Sir Ian Wood Building, Garthdee House, Garthdee Road.